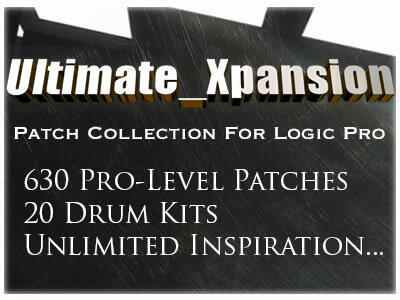 The Ultimate Xpansion Collection for Apple’s Logic provides over 600 pro-level sounds which previously could only be found in seven different channel strip / patch collections with a complete cost of over $500! To say this collection covers a wide range of sonic needs is a major understatement, as that everything from deep synth tones designed for mix fattening, to pulsating pads, wild SFX and fantasy world ethnic sounds are present in large numbers, high-quality and wide sonic scope. This collection also takes full advantage of Logic’s incredible selection of included synthesizers and effects. Everything from Sculpture’s detailed physical modeling, to the ES2’s super-rich, three-oscillator wavetable synthesis is pushed to its maximum. When sample playback via the ESX-24 is used, the source material is of the most exotic origin- resynthesized percussion instruments, vintage analog synthesizers, heavily processed vocal waves- all with goal of providing unique, yet highly usable patches designed to add flavor and texture to any musical project.